Hanford, Washington, has long been the most contaminated nuclear waste site in the US. But critics say poor management has put the site in further danger. When Susan Leckband moved to eastern Washington state to take a job 30 years ago, radioactive contamination was not on her mind. "I loved my job," she says. But it was only a handful of years before the place she worked, Hanford, turned from a plutonium production complex to a massive environmental clean-up site. For Leckband, the question is not about the past, but the progress made on cleaning contaminated buildings and soil. "It's important to the entire Pacific North-West... the food crops, the salmon, the Indian tribes - it's a huge, huge obligation," she says. 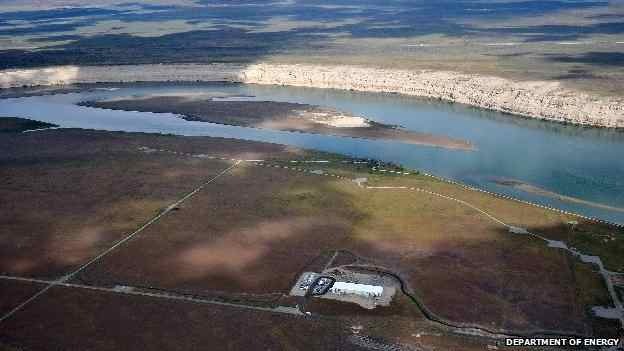 Situated on a plain along the Columbia River, the Hanford site is where the US produced plutonium used in the Manhattan Project, for the bomb that destroyed Nagasaki, and for a Cold War stockpile. Despite being a professional place of destruction, Hanford was teeming with life by the end of World War Two. In her book Plutopia, historian Kate Brown describes how Richland, the largest town near the site, was one of the first "nuclear" communities, a structured suburb for Hanford workers with high security clearances. Working at Hanford, even when many didn't know the full extent of what was being produced, was considered patriotic. 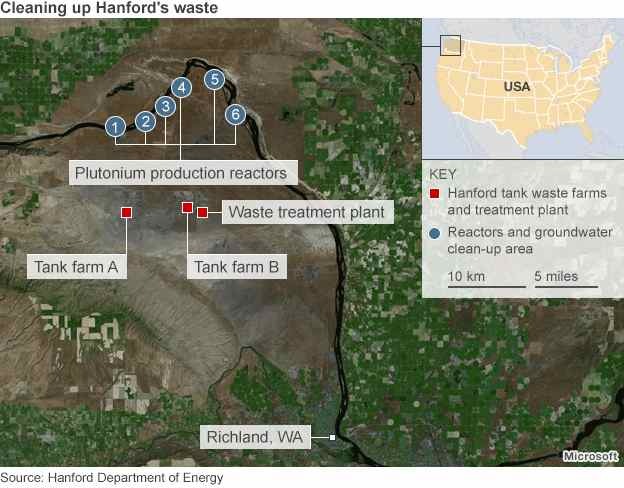 Sixty years later, Hanford is in the midst of America's largest nuclear waste clean-up operation, which has already cost $40bn (£24bn) and is expected to continue for decades. And despite some progress, the site's most complicated and potentially dangerous waste issue - 56 million gallons (255 million litres) of high-level radioactive waste sitting inside tanks at the centre of the site - is facing more problems. In the mid-1980s, activists and reporters began to unwind Hanford's history, detailing safety lapses and environmental hazards across the site. "They made the plutonium, but they did it in a very dirty manner," says Tom Carpenter, director of watchdog organisation Hanford Challenge. By 1989, Hanford was no longer a bomb factory, but a site in need of serious clean-up. Twenty-five years later, the region around Hanford is once again booming. Clean-up has taken the place of the business of plutonium production. The US Department of Energy (DOE), which manages the clean-up effort as part of an agreement with Washington state and the Environmental Protection Agency (EPA), counts among its accomplishments at Hanford seven reactors cocooned for future dismantling, nine billion gallons of treated groundwater, and hundreds of cleaned or demolished buildings. "It's staggering how much material we've moved," says Dennis Faulk, a Hanford project manager with the Environmental Protection Agency. But critics of the way Hanford has been managed are worried that contamination could become worse. In February, Oregon Senator Ron Wyden accused the DOE of a "never-ending pattern of failing to disclose what it actually knows about conditions at Hanford". Wyden is most recently concerned about the tanks holding by-products of plutonium production, buried just below the surface at the centre of the site. The original containers, single-shell tanks built in the 1940s and 1950s, had already leaked at least 1 million gallons of liquid waste into the ground. Hanford officials built double-shell tanks in the 1970s and 1980s and began transferring the radioactive waste into the newer vessels. But in October 2012, the energy department announced one of the double-shell tanks was leaking into the space between the two shells. Waste in that tank has not entered the environment. Wyden released an engineering review that said six other double-shells had similar construction flaws. He accused the agency of hiding what they knew, as the report had been made months after the initial leak announcement, but no other warnings from the DOE had followed. Meanwhile, Hanford officials have recently submitted a plan to start emptying the leaking tank in two years. Then, in late March, two dozen workers fell ill because of chemical vapours near the tanks. Workers again noticed vapours around the tanks in May. Tom Fletcher, assistant manager of Hanford's tank farms, told the BBC in February that what Senator Wyden released was "one data point" and that visual inspections on the six tanks conducted after that report showed no abnormalities. But in general, the double-shells must do their job for several more decades until a waste treatment plant - currently under construction - immobilises in glass all 56 million gallons of waste in the tanks. The treatment plant was scheduled to become operational by 2019, but construction has been slowed or entirely halted on two key parts of the plant for additional testing. Once the treatment plant goes into operation, parts of it must be run entirely by robotics because of the high radioactivity of the waste. Regulators call it a "black-box" system. Hanford Challenge represents two whistleblowers, Walt Tamosaitis and Donna Busche, who say they have been punished for expressing concerns about the treatment plant's design. Carpenter says the whistleblowers are speaking up now because once the plant begins operations, there will be no chance to fix potentially dangerous errors. Both Tamosaitis and Busche have been fired by URS, one of the contractors at Hanford. The energy department says it has asked its inspector general to "review the circumstances surrounding the termination of Ms Busche", a safety manager who alleged continuing harassment since she first brought up concerns in 2011. Meanwhile the waste remains in the aging tanks. Tom Fletcher said when the time comes to start retrieving the waste for the treatment plant, Hanford will be ready. "We have those technologies now," he says, explaining that the leaking double-shell tank would be treated much the same way the single-shell tanks currently are. Hanford and its contractors are also facing pressure from a source closer to home. In March Washington Governor Jay Inslee threatened legal action if the energy department did not accept a new state proposal on cleaning up the waste tanks or develop a new one with "sufficient detail". Inslee wants to create a series of deadlines to solve the technical problems at the waste plant, making sure it begins working by 2028. And the Washington governor also wants Hanford to build new double-shell tanks, a proposal that energy officials have heard before, but not adopted. Now retired, Susan Leckband continues to serve on Hanford Communities, an advisory board for the clean-up effort, but she is frustrated by the slow pace. What's been done already, she says, is low-hanging fruit. "Can we do a better job?" she says.